The celebrity guest in Attack of the Radioactive Thing is also completely playable. Inhabit the Mistress of the Dark with this unlockable character code. Every celebrity Call of Duty: Zombies guest is playable in Infinite Warfare, including such names as Kevin Smith, David Hasselhoff, and Pam Grier. Summoning them is always much easier, and there's definitely something amusing about fighting zombies alongside the Hoff. There's a camp factor to everything in this latest set of Zombies maps, and these stars all follow the same formula -- they can only be played after beating the main Easter egg, and then inputting a "cheat" code. Get all the details to unlock Elvira below. 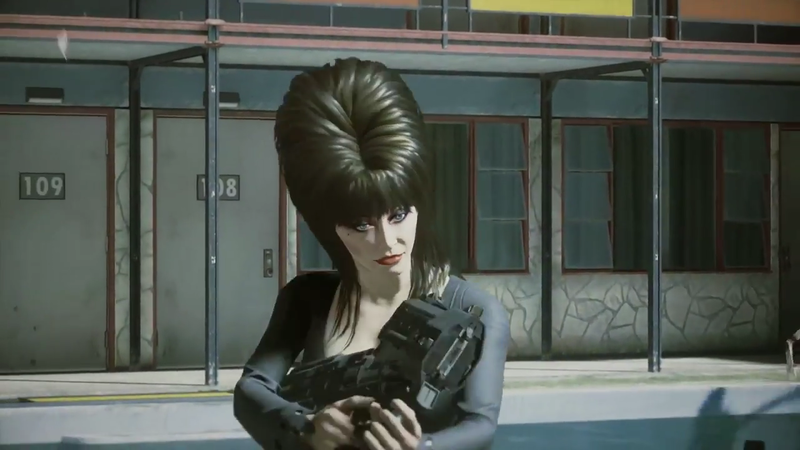 To unlock Elvira as a playable character, you'll first need to complete the central Easter egg for the map. That involves opening the Pack-A-Punch Room, finding zombie body parts, finding Nuclear Launch Codes, getting the key to the Gas Station garage, and mixing up a whole lot of chemical compounds. It's really tough, and the full guide is up in the link bank above. When it comes to actually unlocking Elvira as a playable character, all you need to do is input a code after witnessing the ending cutscene at least once. If you have the Soul Key achievement / trophy, you can play as Elvira. #1. Complete the main Easter egg. #2. Go to the selection menu and choose the Attack of the Radioactive Thing map. #3. Before entering the map, input this code: Down, Right, Down, Left, Up, Right. If you input the code correctly, the menu will change and show Elvira's picture. You'll need to input this code every time you want to play as Elvira. It's pretty simple, and like all the other celebrity guests, the code is written somewhere on the map -- in an incredibly obscure spot, but don't worry about finding it yourself. All you need is the code. You'll even unlock an easy achievement / trophy for playing as Elvira. Why not get the whole team on-board? Elvira's for all.